Typical Domestic Babe: Sale Items! Sam Edelman 'Mason Sandal. View it here. Comes in 3 colors including a GORG coral color which would look great w/ sunkissed feet and vibrant polish. Would look amazing with white skinny jeans, or the right pair of high waisted shorts! Vigoss Print Skinny Jeans, view here. Printed denim is so on trend! 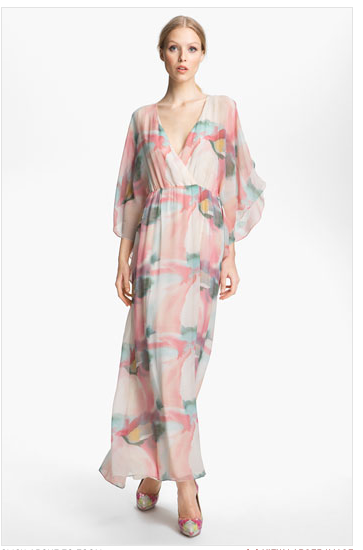 Alice + Olivia Print Silk Maxi Dress. See it here. Such a gorgeous dress! Those colors are amazing. My stylist that I used for a recent shoot had brought me this dress but it was too big, definitely size down. Would be perfect for a summer wedding. The cut and fit is very "Greek Goddess" feeling. DV by Dolce Vita "Ayden" Sandal, see it here. These sandals come in EVERY color under the sun! Love the 2 tone straps. BlankNYC 'The Little Queenie' shorts, get them here. Perfect print and embroidered details. White denim is such a summer staple. Great sale price, around $50! Two by Vince Camuto denim. See here. 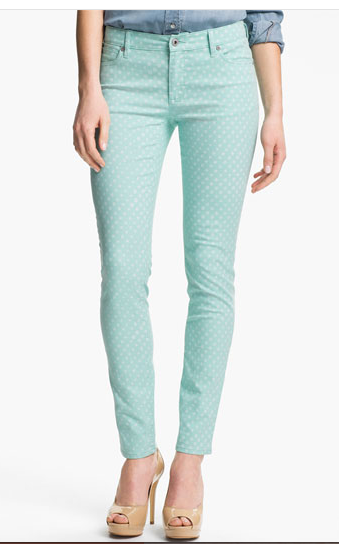 Mint + polka dots! So fun! Slim cut is universally flattering. Steve Madden 'Nanncy' Sandal. Info found here. Very versatile shoe, could work w/ shorts, pants, or with the perfect little sundress. Jolt High Waist Eyelet shorts, view here. Adorable eyelet detail, perfect for summer! No joke, these babies are $25! Alice + Olivia drop waist dress, view it here. Drop waist is extremely figure flattering. Love the vibrant blue color! Great back details including mesh paneling and exposed zipper. Keep me posted if any of you girls end up purchasing these great sale items, and fill me in on any other great finds! !